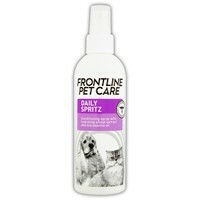 Frontline Pet Care Daily Spritz is a carefully formulated daily conditioning spray for dogs and cats. Made using Rhamnose to help control odour and Luminescine to give antioxidant protection while reviving the coat's natural shine, Frontline Daily Spritz also contains Macadamia Oil and Wheat Extract, which create a double hydration film to refresh and protect your pet's skin. The Frontline Daily Spritz comes in a pump action bottle for easy use and application. Love this product! Have made it part of our daily routine and the dogs coats look super glossy.